Whether you're a renter looking for a weekend project that won't enrage your landlord or a homeowner who simply loves to put a personal stamp on your furniture, welcome to the wonderful world of Ikea hacks (where have you been?!). From stylish, reimagined Ivar chairs, Malm chests of drawers and glass cabinets to projects the kids (cough, parents) will love, our pick of the best Ikea hacks provide a springboard into the Ikea hackosphere, with step-by-step instructions and plenty of inspiration. If you have a go at one of our hacks, we'd love to see how it turned out, so make sure to tag #sorealhomes on Instagram, along with the infamous #ikeahacks. For more easy home updates, visit our weekend projects hub page. Start by priming your Ivar Chair. While this step is tempting to skip, it's worth the time if you want to achieve a quality finish. We'd recommend using the Dulux Undercoat and Primer. Choose your brush. If you're working with an oil-based paint, opt for natural bristles, or for water-based choose something synthetic. The Chalk Paint Wax Brush is an affordable option. Start painting your chair with your choice of paint colour. In terms of brands, we'd recommend choosing something from the chalky furniture range at Rustoleum or Annie Sloane's chalk paint. A good match to achieve this look would be the Rust-Oleum Chalky Finish Furniture Paint in Belgrave. Decide whether you're looking to achieve a shabby-chic, or block colour look, as this will determine how many layers of paint you opt for. To achieve this look, we'd recommend two thin layers of paint. Choose your twine. For this look we'd recommend this Mustard Yellow Bakers Twine from Amazon. Start by tying your twine to back of your chair, as close to the base as possible, and simply wrap round and round, keeping the twine tight. We'd recommend tackling one section at a time; neatly tying them off at the end before moving onto the next section. Tuck in any ends twine ends sticking out. A big hit on Instagram (check out #duktig and you'll see), we love this take on Ikea's Duktig play kitchen. Easily achieved, all you'll need is some paint, wallpaper and a bit of creativity. It's easy and the kids (read: you) will love it. Follow our instructions below to achieve this look. Start by considering which parts of your Dutkig Play Kitchen you'd like to paint, and tape off sections that you'd like to leave unpainted – we'd recommend using Frog Tape. Remove (or don't add) the handles and sink section as this will make painting much easier. The next step is priming. While this step is tempting to skip, it's worth the time if you want to achieve a quality finish. We'd recommend using the Dulux Undercoat and Primer. Start painting the sections of the play kitchen's you've decided need it in your choice of colour. We'd recommend choosing something from the chalky furniture range at Rust-Oleum or Annie Sloane's chalk paint. To achieve this look, the shade Winter Grey from Rust-Oleum is a good colour match. You'll want to paint two, thin layers. While the paint is drying, it's time to spray paint your handles, as well as the sink section. The Plasti-Coat Premium Spray Paint in matt white is a good choice. As the Dutkig Play Kitchen doesn't come with a back panel, you might want to source your own if, for you, this is an important part of the finished design. After that, it's time to start wallpapering. This Pressed Leaves Blue Wallpaper is available from Cam Cam Copenhagen, though we also love the idea of using the Salina's Tile Wallpaper from Wallpaper Direct. Once all your sections are dry, you can start putting your finished play kitchen together. Using some pins positioned at regular intervals and a hammer, attach your back panel, and then your freshly sprayed handles and sink. Finish by attaching some wooden knobs, if it takes your fancy, and decorate with play cutlery and crockery. Designing a kitchen and looking for unique, yet affordable, kitchen cabinet solutions? This Ivar cabinet hack has you in mind. Whether you like the unfitted look of mismatched, complementary colours or prefer something a bit more uniform – we're thinking dark blue or black to channel our love of moody interiors – cfollow our instructions below to achieve this stylish finish. The first step to achieving this look is priming the cabinets you plan to paint. While this is a step that's tempting to skip, it's worth the time if you want to achieve a professional finish. We love the Dulux Undercoat and Primer. Take time to choose brushes. As a general rule, oil-based paint works best with natural bristles, while it's best to choose synthetic for water-based paints – pick these Chalk Paint Wax Brushes if you're on a budget. When picking paint, we'd recommend opting for chalk based furniture paint, Rustoleum or Annie Sloane's chalk paint are great options. To achieve this look, choose paint in three complementary shades of blue – Paris Grey, Graphite and Louis Grey , along with a blank cabinet, would be perfect for recreating this look. For an even finish, opt for two, thin layers of paint and a coat of yacht varnish for a hard-wearing top coat. Once dry, you're free to organise your cabinets as you wish. Easy, or what? Top Tip: Considering mismatching, complementary colours but not taken with the idea of blue? The trick is to ensure the colours you pick have the same tone. Love the colour-blocking trend but can't – we feel you, renters – or don't want to commit to it on your walls? This hack on the Moppe chest of drawers is a great way to experiment with this (or any other) trend, incorporating it into your space on a non-permanent basis. Follow our super simple instructions for your own block-coloured storage solution. If you want to achieve the colour-block effect, you'll need to decide where you want to use each colour. It's advisable to use a pencil to lightly draw in lines that can guide you towards achieving your desired finish. Once you've decided on a design you're happy with, start taping off the first section (we'd advise using Frog Tape), ready for painting. When it comes to choosing paint, we'd recommend using a chalk based furniture paint – one from Rust-Oleum or Annie Sloan will work nicely. Pick colours that suit the look you want to achieve, or to recreate this look opt for Strawberry Vanilla, Winter Grey, Powder Blue and Chalk White. Tackle one section at a time, painting two thin layers and ensuring they've dried completely before peeling off the masking tape and taping the next section in preparation for more painting. Repeat this process until all of your sections are painted. Finish off with a coat of yacht varnish. Beauty lovers will be only too aware of the pain that comes with having (dare we say) too much makeup. If you're on a mission to get organised, this luxe hack on a Maximera drawer divider is just what you need. Find out how to achieve it with our step-by-step guide. Arguably the most important step is choosing what you'd like to use to line your drawers. To recreate this look, opt for this Gold Glitter Self Adhesive Film . Alternatively, we love the idea of Marble Effect Grey Self Adhesive Film. Take time to carefully measure and cut your self adhesive film so that it fits snuggly on the inside of your drawers. Make sure to smooth out the edges and corners. Once this is done you can move on to the drawer dividers, taking time to wrap your adhesive around, before cutting for a perfect fit. Again take time to smooth out the edges. Once this is done, simply slot all the pieces together and restock with (freshly decluttered) make-up. 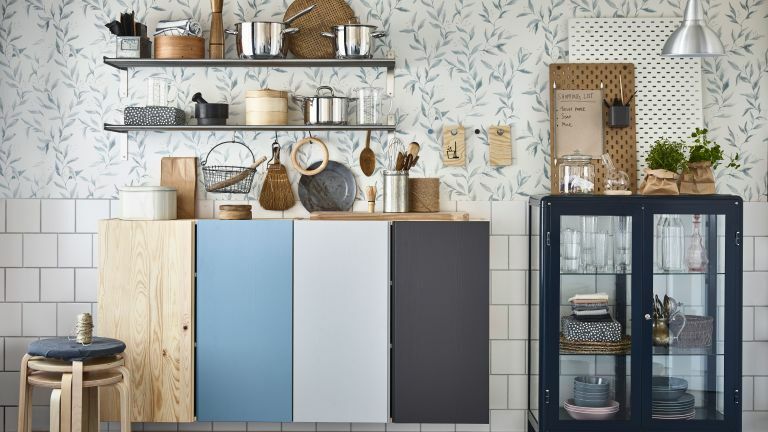 We love how simple, yet effective, this Ivar cabinet hack is in transforming Ikea's most basic cabinets into unit with a distinctly bespoke and built in feel. Achieve the same result using our step-by-step instructions below. The first step to achieving this look is priming the cabinets you plan to paint. While this is a step that's tempting to skip, it's worth the time if you want to achieve a professional finish. We'd recommend using the Dulux Undercoat and Primer. Take time to choose brushes. As a general rule, oil-based paint works best with natural bristles, while it's best to choose synthetic for water-based paints. To achieve a built-in look, it's vital that you use the same colour for your cabinets as you have for your walls. To recreate this look, we'd recommend opting for Dulux Teal Tension, which is available at B&Q. For an even finish, opt for two, thin layers of paint and a coat of matt yacht varnish. Once dry, attach these Osternas Leather Handles and mount your painted cabinets on the wall. Style with house plants, framed prints and other quirky curiosities. Start by finding decorative stickers that work with your space – we love these Ikea Vanity Stencils Decals and Minimalistic Tropical Leaf Furniture Stickers, both from Etsy. Once your stickers arrive, simply peel of the back and stick (as straight as possible) on each of your drawers. We told you this one was easy! The best thing about Ikea hacks? Sometimes they're just about finding practical solutions (though it's even better when they're attractive, too). We love the idea of using the Tjuig coat rack to store pans. Love the idea of a gallery wall, but got a landlord who doesn't approve? We've found the perfect compromise. Once attached to the wall, the Mosslanda picture ledge is perfect for displaying prints and can simply be left in place when you move out, ready to be enjoyed by the next tenants. A great example of the power of mixing flat pack basics with one-off pieces, this hack achieves a stylish, yet affordable finish. All you'll need are two Alex drawer units , two Alex storage cupboards and a desk top of your choice. Try your local salvage yard if you're looking for reclaimed wood. Want to give the Ivar cabinet a unique feel? Us too. Achieve this look with our step-by-step instructions. Take your Ivar Cabinet and, using a pencil, draw a circle in the centre that crosses over the joining of the doors. You might want to use a large plate to ensure that your circle is accurate or, for the more technical amongst us, a compass. Take a wood saw and begin, slowly, sawing, making sure to stay just inside the line drawn with the pencil – this gives space for correction if there are any mistakes along the way. Using sandpaper (we love this 3M Sandblaster), sand away the harsh edges until you're left with a smooth finish. Attach four Lalle Desk Legs – these could be spray painted a different colour, if you choose – and you're done! If your landlord's taste in furniture is... questionable... or you can't afford to replace the tired looking sofa you bought years ago/inherited from a distant aunt, don't write off gorgeous looking furniture just yet. Looking for more weekend projects?